That being said . . . The Myers-Briggs ENTJ personality type is quick-witted and able to configure solutions rapidly. 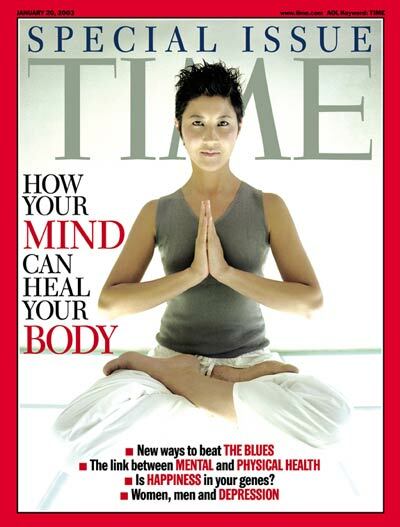 Most people find this “trailblazer” to be stimulating, although often outspoken. They are clever, alert, and problem solvers. In fact, many friends, family members, and co-workers seek the assistance of ENTJs to help resolve complex issues. Their strongest skill is developing a variety of possible solutions and then strategically analyzing them. ENTJs are natural-born leaders, a trait that most people do not have. They are charming and confident, which helps them to project authority, making them popular and influential. Drawing in big crowds with their charismatic personality, people often look up to ENTJs, listening to their words and mimicking their actions. People with an ENTJ personality abhor routine, because they crave excitement, creativity, and stimulation. This trait may lead them to become bored easily in relationships, especially if their partners do not hold their interests. ENTJs typically have high social and emotional intelligences, which make them adept at figuring people out. In fact, their innovative perspectives make them good at solving many problems. They are always looking for a new twist on an old solution. ENTJs are excellent at spotting patterns and making connections, in various situations. Helping people develop strategies is thrilling to an ENTJ. People with this personality type are opportunists, making the most out of every advantage given to them. As idealists, ENTJs can lack realistic vision when it comes to the feasibility of their solutions and suggestions. They are capable of generating incredible ideas; however, many of them are impossible without particular allotments of time and resources. They may also turn others off with their opinions, especially if others do not share in these perspectives. People may think of ENTJs as hostile when confronted with their opinions. People with an ENTJ personality type account for 3 percent of the general population. Although they are not the most emotional and sensitive of all the Myers-Briggs personality types, they are the reason that there are so many jobs in the world. Being trailblazers, they are visionaries of new businesses, organizations, and services. ENTJs are highly successful at work. Their drive, rationality, determination, and sharp wit can propel them to the top of any field. In fact, many are highly respected in their professions, mostly due to their analytical skills and ability to solve problems quickly. They love challenges and respond accordingly, with remarkable work. Because of these characteristics, some may feel that ENTJs are unapproachable because of their high intelligence level, but in reality, they are socially adept and open in conversations. People with this personality tend to be at the top of their class and later at the top of their field. ENTJ personalities are also known for self-confidence and bold attitudes. They may be quick to share their thoughts if they feel others are not living up to their potentials. They do not like excuses. Although it seems that others may avoid ENTJs, co-workers and supervisors are actually drawn to them. Many people respect these individuals, as they are honest, straightforward, and competent. Their visions typically transcend what others immediately see. They are strategists, who know how to communicate effectively at school and at work. 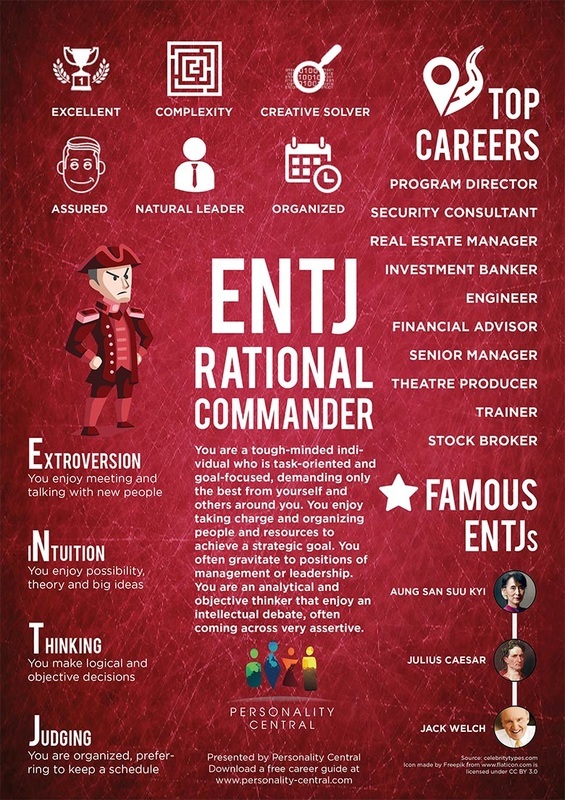 ENTJ personality types are destined to become esteemed leaders in any organization and business. They are natural-born entrepreneurs. Many ENTJs eventually become owners, presidents, or vice presidents of companies. They also do well as managers and supervisors. Their drives, determination, persistence, intelligence, and ability to solve problems make them highly successful. ENTJ personality types also do well as judges, lawyers, corporate strategists, politicians, college professors, and business administrators. ENTJ personalities approach relationships the same way they approach their lives and their careers—incrementally—in order to achieve a goal, which in this case is a successful, long-term relationship. These individuals strive to accomplish their romantic goals and have a hard time accepting failure. Once ENTJ individuals fall in love, they fully give of themselves. They pursue and nurture the relationship with enthusiasm, effort, and passion. People with this personality type are committed, and they love taking the lead in the relationship. More specifically, they like to assume responsibility for the vitality of the relationship—whether it is working or not, and whether or not both parties are happy and satisfied. People with an ENTJ personality must work to assess their partners’ feelings, possibly allowing them to take the lead in the relationship. It is often a struggle for ENTJs to be in tune with their partners’ emotions. The best scenario for an ENTJ is to compromise, finding a balance between constructive criticism, praise, and support when communicating with his or her partner. As far as friendships are concerned, those with this personality type typically prefer to be friends with people who share their common interests. Their friendships grow best with individuals who are constantly seeking personal development and inspiration. They want friends that they can have long, thought-provoking discussions with. They also want friends who can challenge them, and they may become hypersensitive or frustrated in their absence. These individuals need to be cautious about criticizing or challenging their friends. ENTJ personalities approach friendships like they do everything else—step-by-step—in an effort to develop long and meaningful friendships. When ENTJ personalities are invested in the friendship, they make awesome friends, who are supportive, loyal, and loving. Although ENTJ personalities can be highly critical of others, they tend to be more sensitive and loving toward their own children. They have a desire to raise their children to be kind, smart, and out-going people, who work hard and accomplish goals. ENTJ parents also encourage their children to think intellectually, and to be both rational and independent. Moreover, they welcome differences of opinions, as long as they are factually sound. ENTJ parents believe in practicing a more structured parenting style, and they do not allow their children to shirk responsibilities.